Google have now finally unveiled their new cloud gaming service named Stadia, offering instant access to play games in Google Chrome. What they joked was the worst-kept secret in the industry (no kidding), sounds like quite an interesting service. Certainly one that could eventually end up redefining what gaming is. A little hyperbolic maybe? I'm not so sure considering how easy this should be to jump into a game. On top of that, they very clearly talked about how it's built on Linux (Debian specifically) and Vulkan with custom GPUs from AMD. Something they showed off, was how you could be watching a game trailer with a button to play it on Stadia and (supposedly within a few seconds) you would jump right into it. That's quite en exciting idea, one that would easily pull in quite a lot of people I've no doubt. As for resolution, they said it will support 1080p and 4K around 60FPS at release with 8K being worked on as well but that sounds further out if anyone even cares about 8K right now. 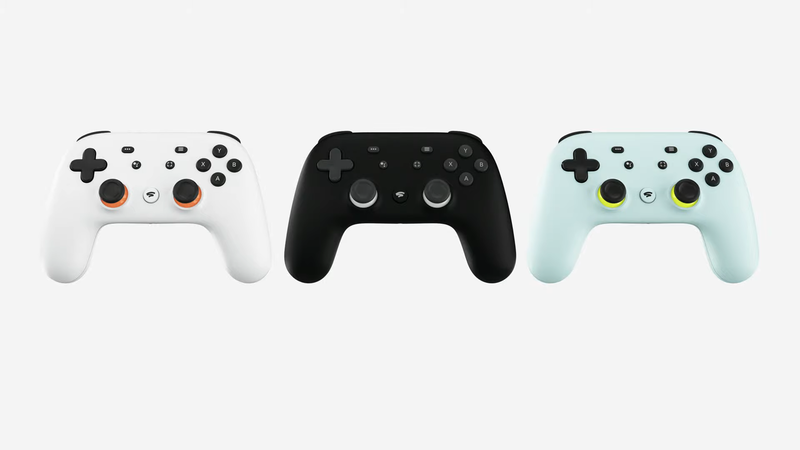 While Google are making their own dedicated gamepad, they did say it will be compatible with other devices too. They also announced partnerships with both Unity and Unreal Engine and Stadia will "embrace full cross-platform play" including "game saves and progression". They also had id Software, talk about how it didn't take long to bring the new Doom Eternal to Stadia, thanks to how they made the previous Doom game with Vulkan. This means, that development for Linux is suddenly going to become a priority for a lot more developers and publishers. I don't want to overstate how important that is, but it's a very exciting prospect. 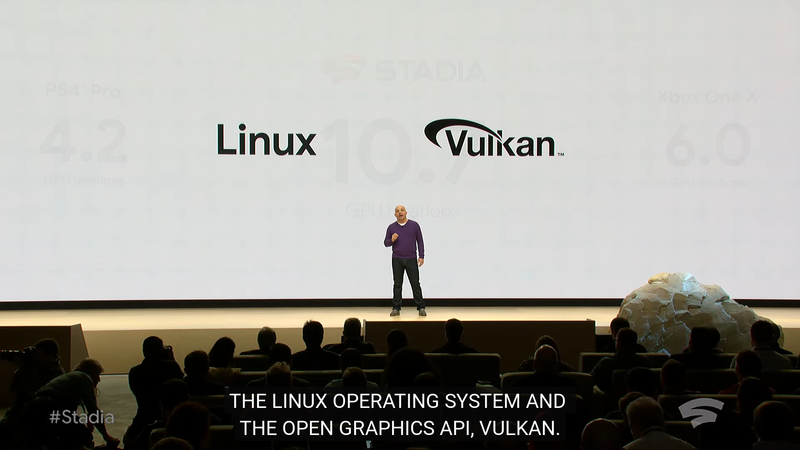 This doesn't suddenly mean we're going to see a lot more Linux games on the desktop, but it's entirely possible after they go through all the work to get the games working on Linux with Vulkan for Stadia. Stream Connect is another service they talked about. They mentioned how developers have pushed the boundaries of gaming but often local co-op is left out, as doing it multiple times in top-end games can require really beefy hardware. With Stradia, each instance would be powered by their servers so it wouldn't be such an issue. 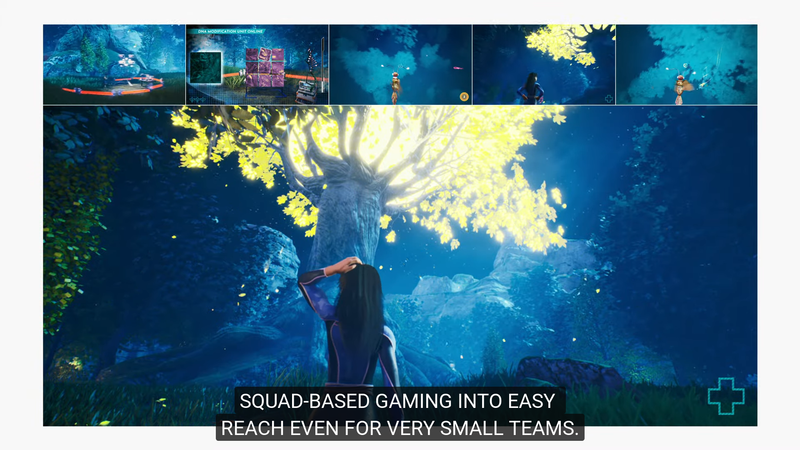 They also talked about how if you're playing some sort of squad-based game, how you could bring up their screen to see what they're doing which sounds very cool. Google also announced the formation of their own game studio, Stadia Games and Entertainment, to work on exclusive games for their new service. As for support from more external game developers, they mentioned how they've shipped "development hardware" to over 100 developers. From what they said, it should be open to smaller developers as well as the usual AAA bunch. 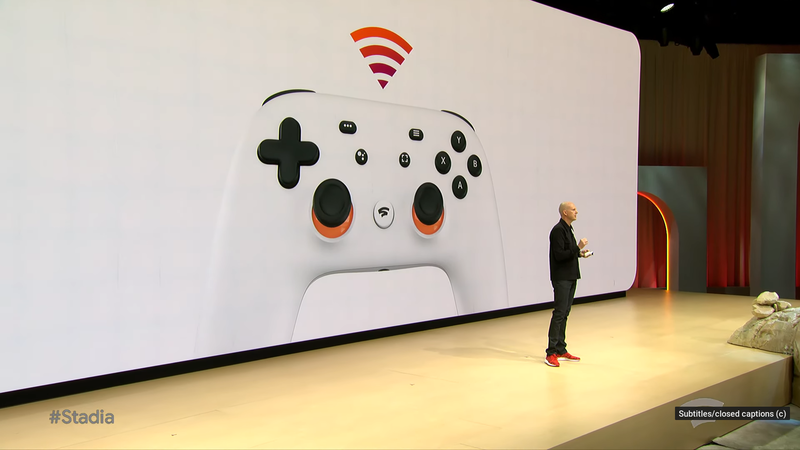 Stadia is confirmed to be launching this year and it will be first available in the US, Canada, UK and "most of Europe". One thing wasn't mentioned at all—price, but they said more details will be available in the summer. The official site is also now up on stadia.com and developers have their own website to look over. Google believes that open source is good for everyone. It enables and encourages collaboration and the development of technology, solving real-world problems. This is especially true on Stadia, as we believe the game development community has a strong history of collaboration, innovation and shared gains as techniques and technology continually improve. We’re investing in open-source technology to create the best platform for developers, in partnership with the people that use it. This starts with our platform foundations of Linux and Vulkan and shows in our selection of GPUs that have open-source drivers and tools. We’re integrating LLVM and DirectX Shader Compiler to ensure you get great features and performance from our compilers and debuggers. State-of-the-art graphics tools are critical to game developers, and we’re excited to leverage and contribute to RenderDoc, GAPID and Radeon GPU Profiler — best of breed open-source graphics debugging and profiling tools that are continually improving. There's probably plenty I missed, you can see their video on YouTube here. As exciting and flashy as it sounds, it's obviously not Linux "desktop" gaming which is what the majority of our audience is likely interested in. However, things change and if it does become a huge hit we will cover it more often if readers request it. Linux gaming can mean all sorts of things from native games to emulators, Wine and Steam Play and now perhaps some cloud gaming so I don't want to rule it out. However, I can't see this replacing Steam, Humble, GOG, itch.io and so on for me personally. Obviously there’s still a lot of drawbacks to such a service, especially since you will likely have zero ownership of the actual games so they could get taken away at any time when licensing vanishes. At least with stores like Steam, you still get to access those games because you purchased them. Although, this does depend on what kind of licensing Google do with developers and publishers, it might not be an issue at all but it’s still a concern of mine. Latency and input lag, are also two other major concerns but given Google's power with their vast networks, it might not be so bad. Also, good luck monitoring your bandwidth use with this, it's likely going to eat up a lot all of it. YouTube and Netflix use up quite a bit just for watching a 30-minute episode of something in good quality, how about a few hours per day gaming across Stadia? Ouch. That doesn't even address the real elephant in the room, you're going to be giving Google even more of your data if you use this service, a lot more. This is the company that failed to promptly disclose a pretty huge data leak in Google+ after all. I don't want to be some sort of scaremongering crazy-person but it's something to think about. As always, the comments are open for you to voice your opinion on it. Please remain respectful to those with a different opinion on the matter. etonbears For me, the interesting implication of Stadia is its ability to change the supply side. The Steam survey shows that the average PC gamer does not have particularly good hardware, and this actually limits developers in what they can do and still address a large enough purchase market. If Stadia has nodes with Vega56 GPUs as a minimum, and allows arbitrary combining of nodes to produce output, then the complexity of what developers may produce for Stadia can scale very quickly to the point that you actually could NOT run it on any normally available desktop hardware, let alone the average rig, making traditional sales of such games redundant. That may be why the new Google game studio is suggesting their titles will be exclusive to Stadia. Of course, however amazing their back-end might be, Google still need to get the right price model, overcome the possible network limitations and avoid their normal habit of turning everything into advertising revenue. Interesting point. Mind you, for most games most of that power would be dedicated to graphics stuff, in which case wouldn't those extra-power-hungry games also be extra-bandwidth-hungry? You could end up trading one bottleneck for another. Which in turn makes me wonder about two futures clashing. Imagine the future of gaming is this kind of streaming solution. Now imagine the future of gaming is VR. I don't think it can be both unless someone spends a bunch of billions on last-mile fibre optics. The bandwidth required for graphics stream presentation has historically increased quite slowly. It is proportional to frame rate multiplied by pixels per frame multiplied by bits per pixel. Desired frame rate has remained at about 60 for decades, and bits per pixel for most people has been 24 for decades. That leaves pixel resolution as the main variant, which has risen from 1M pixel screens 30 years ago to 6M pixel screens now. Network bandwidth increase in those 30 years far exceeds the increased requirements of a graphics stream, so if both network and graphics bandwidth trends continue, the streaming itself should reduce as a cause of bottleneck. Even the bandwidth to support binocular XR presentation should not be an issue since the size of XR screens you can put in front of your eyes is physically limited, and the human eye's ability to resolve detail at close range tops out at around 1000 pixels per inch. In contrast, the amount of additional processing power you can put into determining the content of the graphics stream is effectively unbounded, since almost every aspect of current real-time game production is subject to approximation, simplification and deception, in order to fit into the processing 'budget' available. Sir_Diealot So you are not willing to download 50 GB for a weekend but to download 50 GB for two hours of streaming? If we consider the 25 Mbit/s estimate from a few pages back and 8 hours playing time, you would require approximately 88 GB of traffic. That's insane. wasnt division2 day one patch 92GB? but i waint and see. i dont think it will replace consoles and pcs anytime soon. Audiovisual traffic is heavily buffered ( many seconds worth ) to ensure smooth delivery over an irregular delivery channel, and still you can get such bad contention somewhere on the internet that the buffer runs dry and the stream stutters or breaks. A Stadia game would also be an Audiovisual stream, but one that cannot really be buffered as the stream content must be synchronized with your input device events. Any buffering would show up immediately as lag, possibly making the game unplayable. My knowledge of network traffic is limited but isn't the protocole used for game streaming involved? Is it TCP/IP, UDP or something I haven't heard of? Isn't UDP faster but prone to packet loss thus reducing the quality of the stream? Sorry if I'm totally off topic, because there must be a reason why it's never mentionned. Please enlighten me. silmeth Three years ago I had a solid symmetric ~300 Mbps connection (I actually measured 291 download and 415 upload, sic! – during that time I might have had been the best individual Kubuntu live DVDs seeder out there…). Today that ISP delivers symmetric 700 Mbps for ~$9.50/month. Unfortunately I moved to another city district and had to change ISP to a much worse one. Today I have 120 Mbps down / 12 Mbps up, I don’t saturate it most of the time, but when I do download something, that 120 Mbps is real. I have no problems with simultaneous torrent download and two HD Netflix streams running in my house Friday evening… The situation outside of bigger cities is much worse (often no optical fibers available, so DSL or mobile ISPs only). You are right that I have no idea what would happen if all other users started really saturating the link at the same time. I believe none of my neighbours, besides me, really ever used that ~300 Mbps network back then. But then – how many people will use game streaming simultaneously? If Youtube + Netflix (and Amazon, and HBO Go, etc.) + some people torrenting don’t seem to generate any problems today, I don’t think a game streaming service would change it much, but maybe I am underestimating its impact. As with my comment directly above, game streaming may not add significantly to the load, but game streams need to be real-time, or almost so, as they are much more sensitive to irregularity in delivery than heavily buferred Netflix or Youtube streams. Mohandevir Is it TCP/IP, UDP or something I haven't heard of? Isn't UDP faster but prone to packet loss thus reducing the quality of the stream? TCP includes the control mechanism to deal with packet loss (detection and resending). For UDP it is up to the application to decide whether to detect it and what to do if something is lost. And still be faster than TCP? Or is it better to go with TCP, in that case? etonbears A Stadia game would also be an Audiovisual stream, but one that cannot really be buffered as the stream content must be synchronized with your input device events. Any buffering would show up immediately as lag, possibly making the game unplayable. On the other hand it can (similarly to what OnLive did) lower the resolution temporarily on bandwidth fluctuations to deliver a continuous real time stream. That would not, of course, work on connection loss, and could be annoying. That’s why I would not myself prefer game streaming over regular PC gaming, but, as I argued, that’d IMO be perfect for demo/timed trial gaming before buying the game. I wouldn’t want to suffer a whole game playthrough over a fallible network, but I do prefer streaming 25 Mbit of data every second for a few hours to just try the game than downloading the whole game before I can get a taste of it. Mohandevir My knowledge of network traffic is limited but isn't the protocole used for game streaming involved? Is it TCP/IP, UDP or something I haven't heard of? Isn't UDP faster but prone to packet loss thus reducing the quality of the stream? IP is the underlying delivery protocol. The equivalent of writing the address on an packet and posting it. There is no guarantee that IP packets will be delivered in the order of sending, and no guarantee that any individual packet will actually be delivered at all. TCP and UDP are the most common protocols used to split up application information into packets that you then post using IP. With UDP, each packet is numbered with a sequence number and broadcast to anyone listening on a particular UDP port. Any receiver can reconstruct the data that was sent using the sequence numbers in the packets, but if a receiver does not get all of the packets that were sent, it has no way to ask for a re-send, so it is, as you say, lossy, and the application must tolerate this. TCP is a point to point protocol where the sender sends similar sequence-numbered packets to exactly one address, and the receiver sends back an acknowledgement for each packet received. This allows both parties to know that the data was received, and to re-send any packet that was lost. In theory, either could be used for a game stream, with UDP being faster but needing error correction in an application for the missing packets. In practice, UDP is sometimes blocked by routers, and as TCP is more robust, it is more commonly used. UDP is faster because it does away with some of the work. But if you have large block of data that need to be complete, you'd need the work to be done anyway, so you're better off using TCP. UDP is generally used for small data fragments that expire. Like in game protocols where a single packet can update the position of your fellow players. If you miss such a packet, then resending it is not so useful as you may as well get a new updated one. In case of video streams it depends on what you want. If you every watched digital cable on a bad day, then you know what packet loss means for a digital video stream. Either you accept that you get half a second of mess if you lose something, or you go for data integrity with a possible cost of some more lag. Sure, you can alter the content to fit the stream, but if you want to have the best experience, you do it the other way round if you can. There is a mechanism for this called RSVP ( the Resource Reservation Protocol ) which allows a receiver to reserve a virtual "channel" of a particular size for data from a sender, but it requires all intervening points to agree, and effectively prefer your traffic over the first-come first-served norm for a router. Tricky to get ISP et al. agreements for even a short path, and potentially costly; so the price of using Stadia maybe gets raised again.